AJA International, Inc. has frequently been called on to develop a specialty substrate holder, heater, cooler, etc. when existing designs would not accomplish the researcher's objective. This often involves detailed design consultations (typically free of charge) where new design ideas are explored in conjunction with AJA's extensive experience. Some of these efforts have resulted in new "standard specialty holders" such as the ones shown below. In applications where substrate heating and cooling is required in the same process, AJA has developed some units which operate over a limited temperature range as the optimum designs for heating and for cooling are diametrically opposed. Nonetheless, the specific applications vary greatly and certain combinations work nicely. 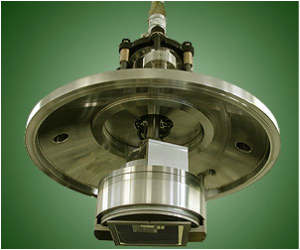 AJA has custom engineered dozens of special substrate heater solutions since 1989. 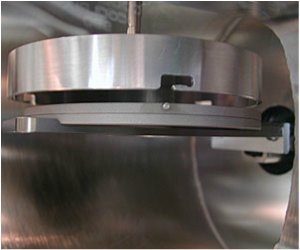 Versions include heaters for square substrates, heaters with a transverse magnetic field, in-situ motorized tilt (shadow depositions) and mask exchange systems (combinatorial chemistry and general patterning). If a custom design is required, please provide details and a sketch if possible and e-mail or fax your requirement to AJA for a prompt quotation. 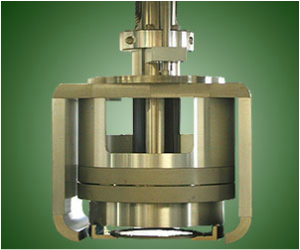 Domed wafer planetaries are commercially available and can be easily integrated into many AJA systems. 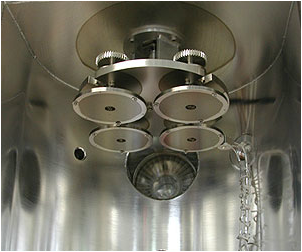 The (4) x 4" flat planetary shown here was developed by AJA and has been operating without downtime for over 10 years. 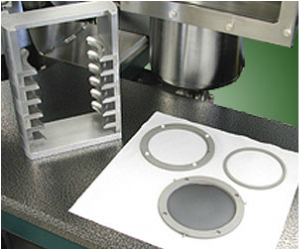 The individual 4' wafer holders can be disengaged without tools for convenient bench (top) loading. 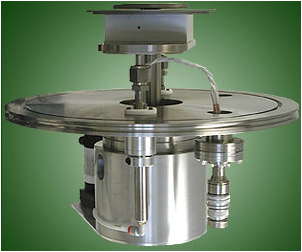 The entire assembly rotates and each wafer rotates azimuthally as is typical with most planetary designs. Adding a simple shield allows for front side heating of the wafer surfaces. .